As we head into the weekend of Week 12, it’s time again to look at our top IDP streaming options for fantasy football. Bye weeks are, mercifully, nearing their end, with only two teams out of action this week and none going forward. But between injuries (as we’ll see below) and three Thursday games, there is still plenty of chances to stream. As always, we’ll kick things off with a look back at last week’s streamers to see how we did. In Week 11, it was our secondary that led the way, with Giants safety Curtis Riley recording a pick to go along with his four tackles, while Bears corner Kyle Fuller recorded seven tackles and two passes defensed. On the line, the Washington duo of Daron Payne and Jonathan Allen combined for 12 tackles between them while Falcons lineman Grady Jarrett recorded three tackles and did get to the quarterback twice but couldn’t turn those into a sack. Our linebackers did just so-so with Bengals linebacker Jordan Evans recording a pass defensed but only two tackles while Saints linebacker Alex Anzalone had only three. But now we move on to the post-Thanksgiving streamers you’ve all been waiting for. The last time we streamed an Eagles lineman, Michael Bennett recorded two sacks. But after 4.5 sacks in five games, Bennett may not be available on the waiver wire. However, the Eagles still have a good matchup this week and plenty of good lineman, including Long. Long himself has 3.5 sacks on the season and the second highest pass-rush productivity of any Eagles edge rusher. In fact, he has just six fewer quarterback pressures than Bennett despite rushing the quarterback 50 fewer times. He and the Eagles face the Giants in Week 12, who not only lead the league in sacks allowed, giving up 3.6 per game, but whose offensive line has the third-worst PFF pass-blocking grade as a unit according. The Giants are also coming off a game in which they gave up four sacks and there’s a good chance they do it again with Long leading the way. While the Bengals linebacking corps has been decimated this season (we’ll revisit that below), the defensive line has been healthy. Now, healthy doesn’t necessarily translate to good, but they’ll have a chance to curb that trend this week against the Browns. Why is that? The Browns are currently second-worst when it comes to allowing sacks at 3.5 per game to go along with attempting a healthy 37 pass attempts per game. As for which Bengals linemen stand the best chance to capitalize on the Browns weakness, both Hubbard and Willis are good streaming options. Hubbard, a rookie drafted in the third round, is third on the team with three sacks, while Willis, who has no sacks, still has double-digit quarterback pressures with 17, which is actually more than Hubbard. More importantly, both see significant snaps, with Hubbard logging 320 so far while Willis is up to 397. Both also have seen at least 30 snaps in each of the last three games as the Bengals use a steady rotation of ends. Couple their above-average use and the Browns above-average pass attempts and there will be plenty of opportunity. Speaking of the Bengals, Nickerson is also a great streaming option but more because of the injury bug. He’ll be taking the place of linebacker Preston Brown, who was placed on injured reserve with a knee injury. Brown had been second on the team in snaps but only because he’d missed two weeks prior to this — two weeks, coincidentally, filled in by Nickerson, who recorded seven and eight tackles in Brown’s absence in Weeks 2 and 3 respectively. 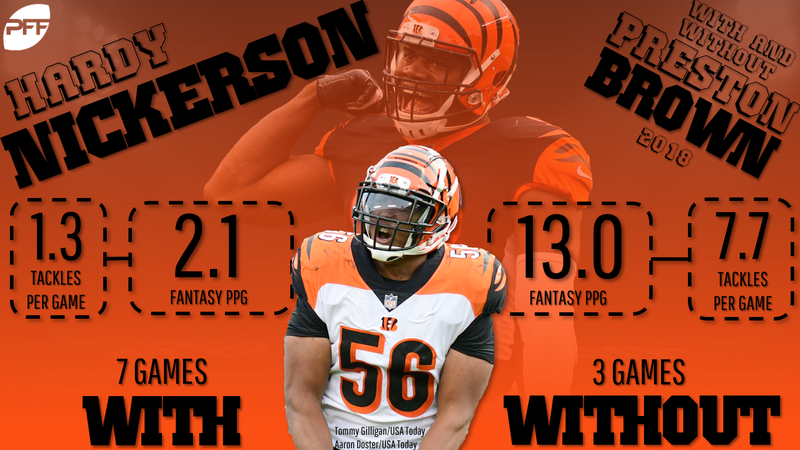 In real life, Nickerson hasn’t played great and is actually the lowest-graded Bengals linebacker according to PFF graders, but he’s certain to see the field a lot. Nickerson and the Bengals now play the Browns, who are third in the league when it comes to offensive plays, averaging 68 per game. That should lead to plenty of tackle opportunities as it did last week when Nickerson started against the Ravens. Baltimore currently leads the league with 71 offensive plays per game and Nickerson went on to record double-digit tackles for the first time in his career. The last time we streamed Smith, he went off for three sacks against the Titans. I think it’s time to fire him up again as he takes on a bad Raiders team. The Raiders are currently the fifth-worst team when it comes to giving up sacks, allowing 3.3 per game, and grade out as a bottom-five pass-blocking unit. They’ve also given up four, four, and seven sacks, respectively, the last three weeks. As for Smith, he’s been the Ravens leader in actual pass-rushes, quarterback pressures and pass-rush productivity, while ranking in the top-20 in the league of the latter two categories. Unleashing Smith against the Raiders should lead to a very good day. After a slow start to the season, Stewart has really turned it on in recent weeks. He had 10 tackles and a pass defensed last week against the Chargers and in the immediate game prior to an injury that took him out a few weeks, he added nine more tackles. He’ll have plenty of more chances this week as the Steelers currently rank seventh in the league when it comes how many offensive plays they run per game (66). Even better for Stewart, and the entire Broncos secondary, is Pittsburgh leads the league in pass attempts per game at nearly 42. Steelers quarterback Ben Roethlisberger is also coming off a game where he had six passes defensed to go along with three picks, something Stewart and the Broncos hope to replicate. Fantasy-wise, Ward hasn’t done anything to write home about, recording only 23 tackles in eight games this season. He’s also only in the middle of the pack on his own team when it comes to PFF grading. But his and the Niners matchup against Tampa this week is just too good to pass up. For starters, did you know that Tampa has not one, but two (! ), quarterbacks in the top three of the league when it comes to interceptions? Well you do now (and the 49ers certainly know). This week, Tampa is sacrificing Jameis Winston who, despite playing in only five games, has 11 interceptions, eight in the three games he’s started. For Ward, this will be as good a game as ever to record his first pick or even pass defensed of the season. He sees a target on every 10.8 snaps, which will be handy as Tampa is second in the league with 68 offensive plays per game. In short, I want some kind of exposure to the 49ers defense this week and Ward is our best shot.